Time period, in which Szmaj was a member of a Poznań based artistic group—Bunt, is the most important within his artistic career. At that time, he executed numerous linocuts, of which significant part was published in the Zdrój ( a leading Polish expressionists magazine). Szmaj’s linocuts reflect his fascination with Dresden based Die Brucke and Munich based Der Blaue Reitter groups. 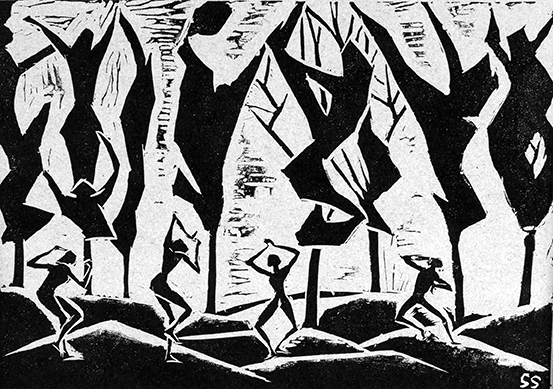 Relief printing (woodcut and linocut)—was a distinctive technique for the expressionists. It enabled artists to achieve strong white and black contrasts, and to maneuver with a wide, sharply cut surfaces in order to strengthen the final visual effects. Within Szmaj’s body of work one can find artist’s self-portraits and images depicting people who he befriended and reckoned as important in his life. These can be seen as a record of the artist’s feelings and his subjective visions rather than an objective rendition of the physical reality. Landscapes, alike the portraits are more a record of a bitter Szmaj’s reflection on the contemporary world, lesser an awe of a surrounding nature. The artist in the linocuts keenly raised subjects that were often perceived as controversial, even scandalous: he often referred to eroticism and religion. His oeuvre, alike other Poznań based members of the Bunt group, is an expression of a fight for the freedom defined as a personal, artistic and political one just before and little bit after Poland has regained its independence.